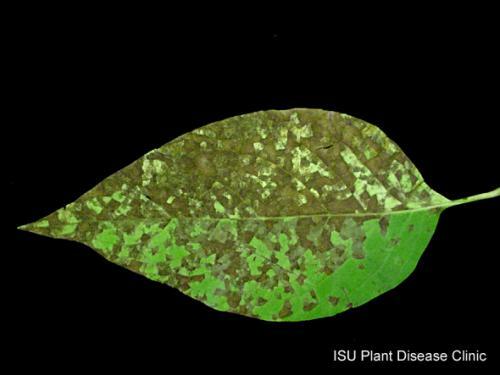 Leaf spot on Japanese tree lilac has been identified as a fungus belonging to the genus Pseudocercospora. Other leaf spots caused by members of this group of fungi include leaf spot on olives, guava, and mulberry. Pseudocercospora is often able to survive 2 years in the plant debris that is scattered on the ground. Removing and destroying leaf debris and pruning out dead branches may be the best and easiest strategy in reducing disease. Pseudocercospora leaf spots rarely become severe enough to cause the decline of the plant. However, if repeated severe infections occur, preventative spring fungicide applications may help prevent disease. However, no fungicides have been specifically tested for leaf spot on Japanese tree lilac. Pseudocercospora fungal leaf diseases on ornamental plants are controlled with fungicide applications in the spring- starting when the leaves first emerge from the buds and repeated every 14 days (or however the label instructs) through the rainy period of spring.